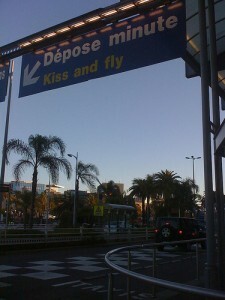 This article was originally written during MIPTV 2010, when thousands of people were stranded in Cannes and Nice due to the shutdown of European airports. The info remains useful in case of air or rail strikes, which is why I left it. News is added in the comments section as updates. Although many people are trying to put a brave face on it, when you’re stranded in Cannes you are still stranded. Most people have jobs to get back to, and are racking up bills for hotels and trying to keep in touch with people back home. Several Cweeps (Cannes Tweeps) use Twitter as a way of relaying news, tips and offers to share cars and coaches to people that are stranded in Cannes by French rail and air strikes or volcanic ash. Many visitors living on mainland Europe can find alternative ways to get home, most of which involve 15 hour trips on motorways. Nice airport (which can be quite slow). Alternatively, to get SMS/text message updates concerning your flight, send “NICE [your flight n°]” to the French phone n° 71009. It costs 50 eurocents, plus the cost of your call on your carrier. But remember that text messages are not necessarily instantaneous. Twitter has been invaluable in providing information and hooking people up. A number of hashtags sprang up, including #stranded, #ashtag, #getmehome. My tip, however, is to use the #euva hashtag, as this is used by people such as EuroControl to exchange breaking news about European air traffic. Follow it here #euva and read the comments below for more Cannes travel news and links. Excellent. I hadn’t heard of this one. I like the theme you are using on your blog. Dan, that’s the talented cookies at WPZoom. EDIT: not any more. I change themes occasionally. Actually diggin what you have been posting here lately. I’d love to see you continue with much more of this. Bookmarked!